Very attractive design perfect for wedding prom party wear black color pearls cuff bracelet comprised of pearls & silver wire cuff truly amazing this fun bracelet makes great birthday gifts or return gift for your friends . This item in Bracelets & Bangles category was first added to our catalog on 11-03-2015. 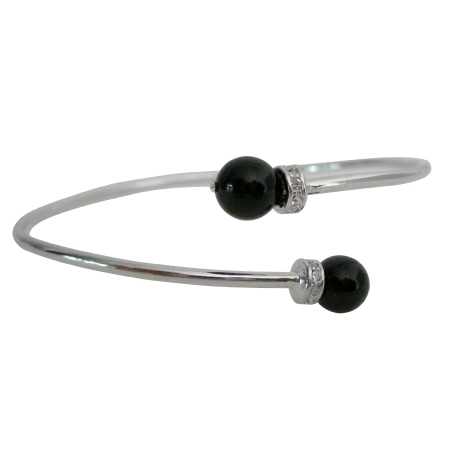 Buy Prom Birthday Party Black Pearls Silver Cuff Bracelet , sold & shipped by Fashion Jewelry For Everyone where you can shop online for Leading Online Retailer for Indian Fashion Jewelry. This Bracelets/Bangles collection has been tagged as Prom Bracelet,Party Bracelet,Pearls,Bracelet,Black Pearls,Black Bracelet,Pearls Party,Pearls Bracelet,Silver Pearls,Silver Bracelet,Cuff Bracelet,Bracelet Black,Bracelet Pearls,Prom,Birthday,Party,B.